We're Awakening! : BREAKING: "Your Love Is a Song" scheduled for a Top 40 Mainstream release June 29, 2010! 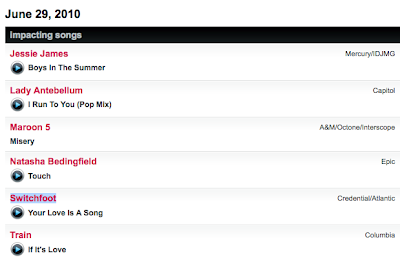 BREAKING: "Your Love Is a Song" scheduled for a Top 40 Mainstream release June 29, 2010! Looks like Atlantic will be going with the double single; pushing "The Sound" and "Your Love Is a Song" at different formats simultaneously. Could be a good idea! Thoughts? WOOOOOOOOT! I'm psyched to hear this! :D This is awesome, bring on the Hot 100! FINALLY. This is the best song on the CD...and has huge TOP 40 potential. Thank you! Is this too early, or is that just me? The Sound is still gaining ground; wouldn't doing this put both of them rotating around the same time, and therefore getting less total votes they would get otherwise? Yes, I know different formats, but still, I think this could make The Sound slow down faster than otherwise. @Jared, I feel the same way. I feel like they should've given The Sound more time to breathe and saturate the radio... give it a chance to even possible have crossover appeal? But I suppose Atlantic wants to work YLIAS slowly and gradually, so any real action at Top 40 will happen a few months from now...? Who knows. Hopefully everything works out!